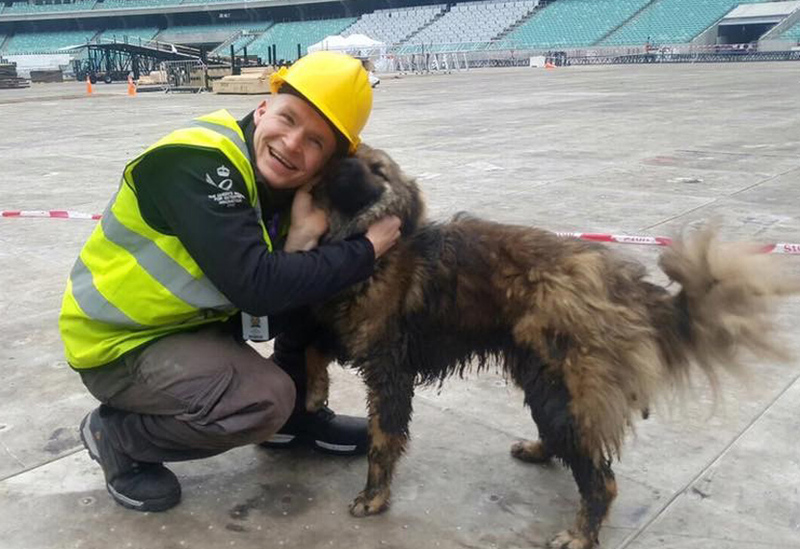 Sadly, stray dogs are not a new phenomenon to our crews working on-site across the world. 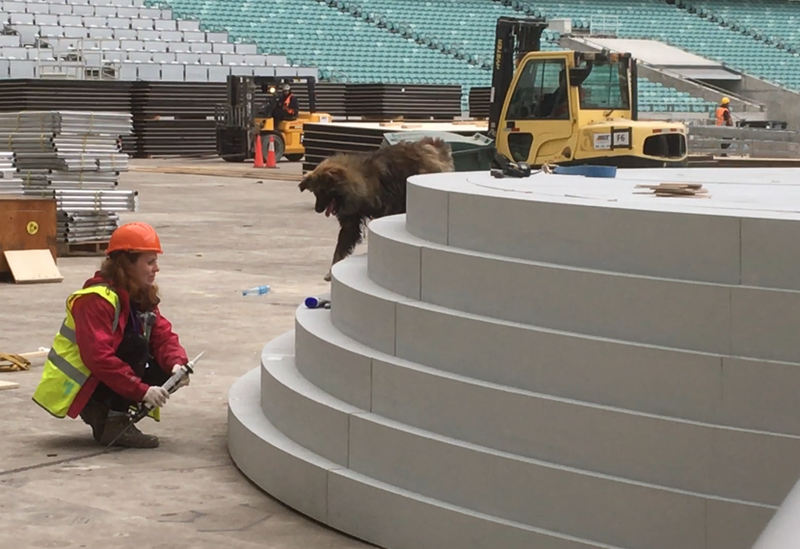 Often arriving for months of extensive fit-ups in new, sometimes even unfinished stadia, these sites and their surrounding hinterlands are often a chaotic mix of disparate contractors undertaking all manner of schedule-chasing building work. Street dogs are part of this mix and although usually regarded as pests by the local authorities, they become part of every day life for crew. The combination of certain canine personalities in particular and hard working crew, far from home lead to some strong bonds and rather touching photos. 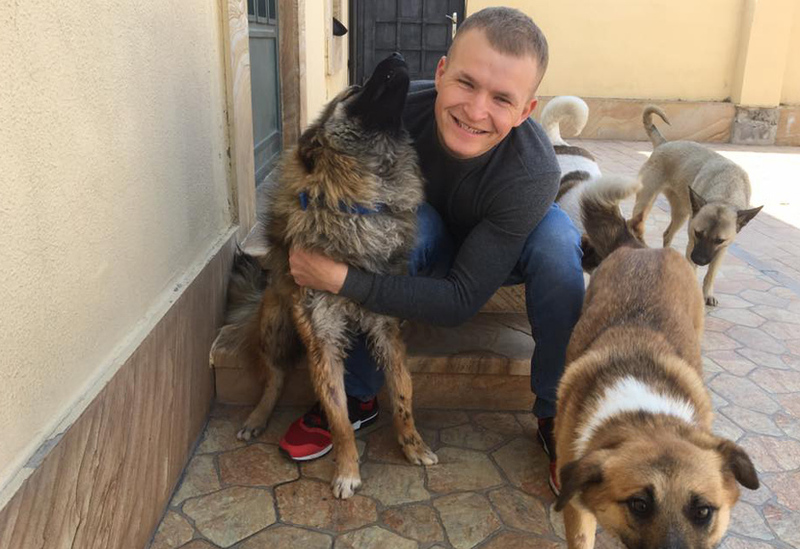 The following story has come to us from Project Manager Dan Bell in Baku. “Meet chewy the Baku site dog. 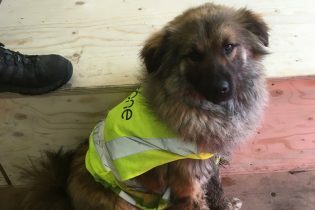 He turned up a week after we arrived on site looking hungry, tired and scruffy. Shy and timid, it took a few days for him to gain our trust as you could see in his eyes he did not trust people or want to come near us. Covered in oil and tar we can only presume he was dumped in the lake nearby. Once he knew we were a safe bunch and obviously soft as anything, he became part of the team wanting love and attention and we became part of his wolf pack. With the trust gained, it was time to try and clean him up. No soap was going to sort him out, so Brian took a trip to the local pet shop in town to get the essential scissors and brushes then started chopping all the tar and oil out of his fur. We were thinking he would rip Brian’s hand off but to our surprise he was on his back loving every minute of it! This is were we knew he wasn’t a stray and had obviously been dumped and left to fend for himself. 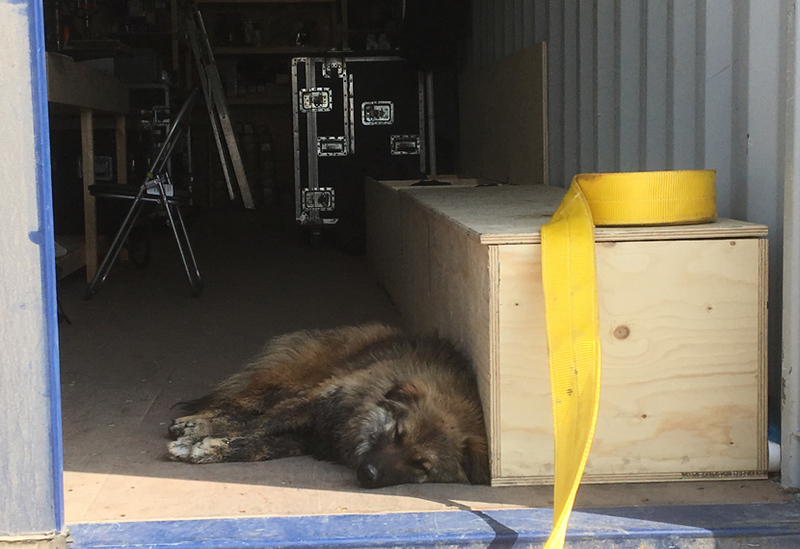 Which made us start thinking…… what will happen in a month when the site goes to lock down and the dogs are rounded up to be removed from site? Well, we all know what happens, it’s either shooting practice one evening for the local authorities or thrown in a van and dumped in the desert miles from anywhere. And that’s not happening to Chewy. 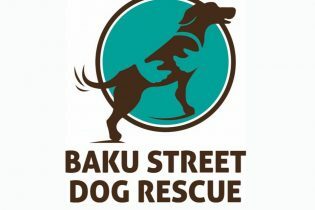 We heard of a lady on site called Natalie who has set up a voluntary Baku Rescue Centre for the dogs roaming the streets of Baku. 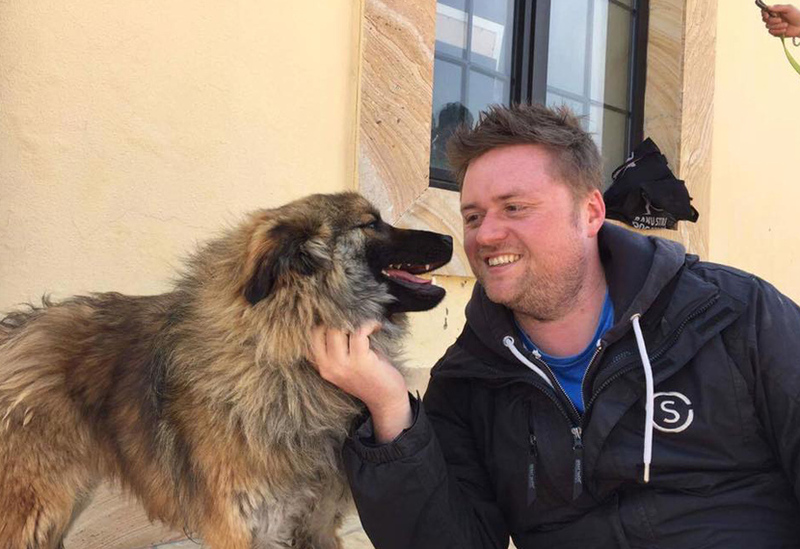 So we had a chat with her and already she has managed to get 8 dogs off site and 6 re-homed in America on this gig alone and 100’s of dogs over the last few years. The crew have chipped together enough funds to give him all of his jabs, a kennel for the next 8 weeks and a good bath before he is ready to fly to his new home.The problem we have now though is, we don’t like the thought of him going to America and we think Tockwith may be his new home. 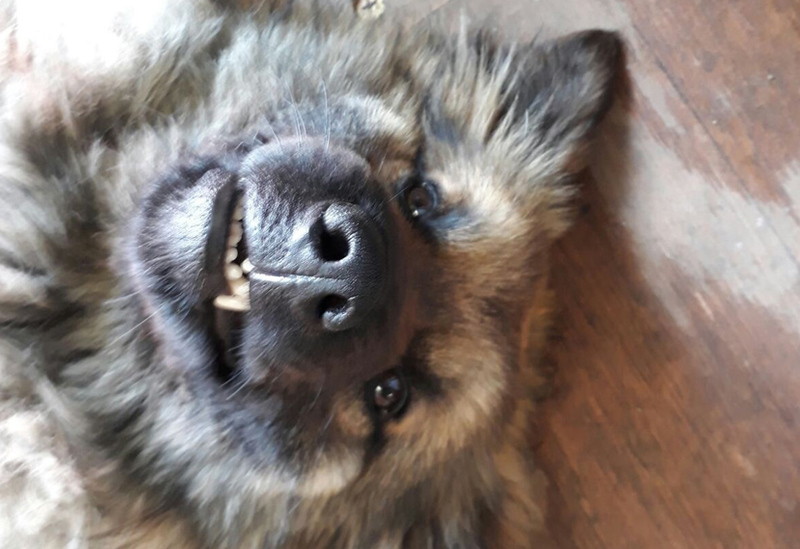 “Chewy was spotted on the Baku Street Dog Rescue Facebook page by one of our followers who already has a Baku dog, Theo. 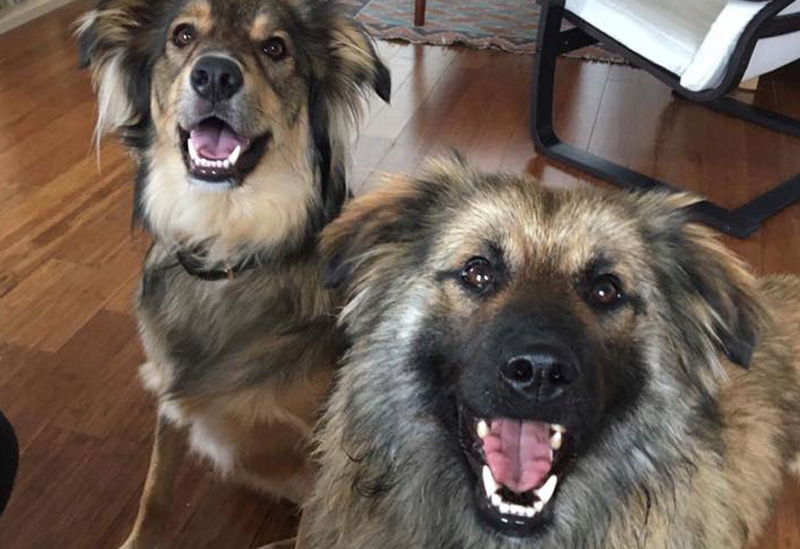 Chewy arrived in New York on 27th May and was met by Maritza our volunteer in NYC. 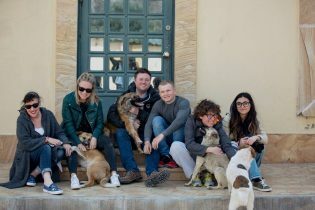 Chewy went straight to Sean Casey Animal Rescue who organised the paperwork for the adoption and the new family turned up at lunchtime and collected Chewy.